A meteorological satellite is mainly used for observing atmosphereic phenomena, but can also be used for observing other phenomena. For example, the satellite can observe sea ice (drift ice) because the reflectivity of sea ice (drift ice) is higher than water surface and looks whiter, and in comparison to cloud, which is another high reflectivity object, sea ice looks slower than cloud. We offer today's status of sea ice from January 1 through April 30, and put it into the annual archive of sea ice images in the past. The current sea ice information is announced in "prefectural sea ice forecast" in JMA Disaster Information XML (in Japanese). The latest information is also available in tweets at @JMAXMLSeaIce. I hope they are useful for tourism and other purposes. Sea ice is formed in Sea of Okhotsk and drifts toward south by sea current and wind. To know the direction and speed of the drift ice, wind information is useful. An Example of Drift Ice Seen on "Himawari"
March 8, 2008 was a clear day around Hokkaido, and the drift ice is clearly visible on "Himawari" satellite image. 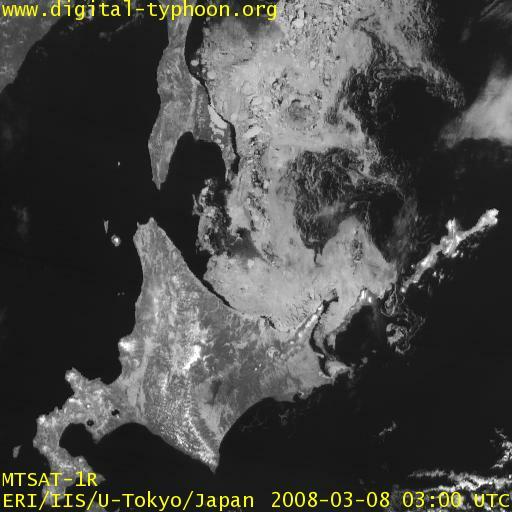 The image below was taken on noon, and the drift ice was floating from the Sakhalin Island to the coast of Hokkaido, and although the large amount was blocked by the Shiretoko Peninsula and Kunashir Island, some go through Nemuro Strait to Notsuke Peninsula and Nemuro Peninsula like a band of ice. According to the news, some drift ice even go further to pass around Nosappu Cape to the Pacific Ocean to reach as far as off the coast of Kushiro. It is not so clearly visible on the satellite image, but you can see fluffy white regions along the coast of Pacific Ocean in the eastern part of Hokkaido. Looking at the animation GIF made from satellite images of every hour, the movement of these regions is much slower than that of clouds, so these regions may be not clouds but drift ice. If the sea ice is hard to recognize, first check the Sea Ice Distribution in the Sea of Okhotsk Larger Image Page - JAXA EORC page and look at the animation again. Then the pattern may emerge from the animation.